For the 24 hours to 23:00 GMT, the AUD declined 0.04% against the USD and closed at 0.7046. LME Copper prices declined 0.9% or $53.0/MT to $5965.0/MT. Aluminium prices declined 0.6% or $11.5/MT to $1869.5/MT. In the Asian session, at GMT0400, the pair is trading at 0.7004, with the AUD trading 0.6% lower against the USD from yesterday’s close. Overnight data showed that Australia’s CBA manufacturing PMI rose to a level of 54.0 in December, following a reading of 53.7 in the preceding month. Elsewhere in China, Australia’s largest trading partner, the Caixin/Markit manufacturing PMI index declined for the first time in 19 months to a level of 49.7 in December, amid weak exports orders. The index had recorded a level of 50.2 in the prior month. 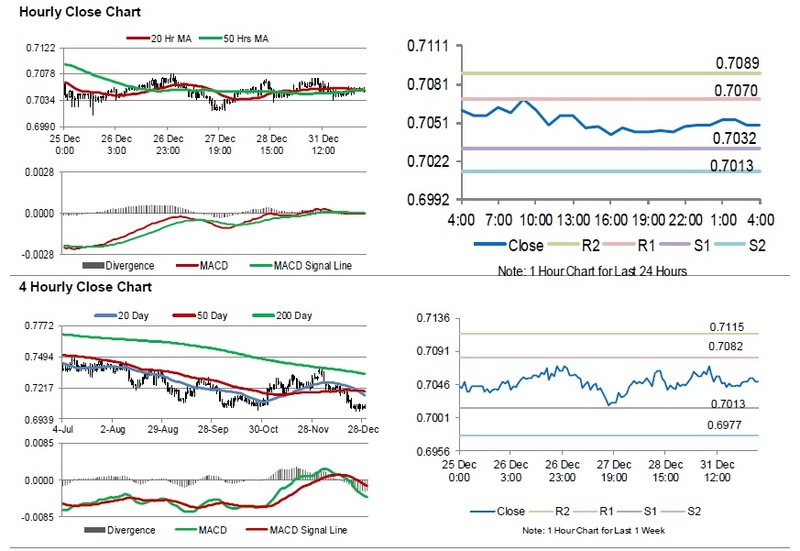 The pair is expected to find support at 0.7001, and a fall through could take it to the next support level of 0.6998. The pair is expected to find its first resistance at 0.7039, and a rise through could take it to the next resistance level of 0.7074.